It happens sometimes, with work and class and trains and general malaise, that I don’t get a book read in a week (before I had a weekly column, I was even slower). I’m currently wending through the Odyssey, which is a pretty stiff read. 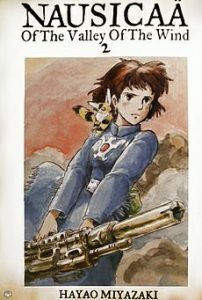 However, I was interested to find a character in it with the unlikely name of Nausicaa, which was also the character of an amazing translated Japanese comic I’d read over the years. Turns out that’s where it’s author/artist, Miyazaki, got it from. It’s been a while since i read it (I’ve got them all here next to me right now and am flipping through them, marveling as always at the amazing art). Essentially, it’s the story of a proud little princess who’s tiny little kingdom becomes a pawn between two larger empires in a dark (or shall I say, ochre) future earth. A thousand years before, pollution and a massive war toppled everything and birthed a massive forest, the ‘Sea of Corruption’, which is slowly spreading over everything (carried by the various huge insects that serve it). Nausicaa is everything you’d want in a hero, strong, honest, thoughtful and compassionate. She tries to end the war, tries to understand the protagonists, tries to set the world on a better course. But just as her actions are “heroic”, the actions of the various other characters are often “human”. The Torumekians invade the Dorok lands, a blitzkrieg in a scale Miyazaki’s art captures. Then the Doroks respond by purposely spreading the corruption over the battlezone, resulting in a loss of life even more staggering. And on it goes, violence and destruction, while Nausicaa attempts to understand, and perhaps even solve, the multi-layered problems. As I write this, fond memories are bubbling up – I remember a Dorok priest, a bald little guy, who first sought her death and then, slowly, began to understand and perhaps even support her. I remember how much his own story moved me, as he shifted from unthinking nationalistic/religious standards to something more humanist. I’ve got my seven-volume set I assembled out of Amazon here – I’ll have to give it another read. I can recomend looking it up. Also, a foreshortened version of this was created by Miyazaki’s anime studio and wonderfully dubbed by Disney, Nausicaa of the valley of the wind. It’s a small taste of the scope of the greater epic, but one well worth watching. Great story. Great art. And I loved her little fox/cat creature.